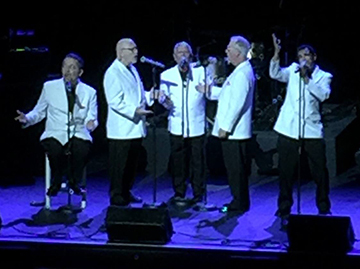 Singing in and around the Tampa Bay area for over ten years, the Boomerz have been performing a cappella music from street corners to the stage. They have entertained at the Royalty Theatre, Palladium Theatre, Florida State Fairgrounds, personal parties, anniversaries, and corporate get-togethers. Their signature sound is a rich harmonic fusion of four distinct voices, and they employ it in the cause of infectious good fun. At Westminster Retirement Community in Bradenton, FL, we at the Towers and Shores location throw lots of parties, concerts, and other events. We know how to have a great time. Well, with the Boomerz in the beautiful backyard under decades old trees residents from all walks came out to enjoy what they are touting as the best party we ever threw! Thanks Boomerz for your professionalism, humor, event specific attire and mostly for the amazing music! You captured our attention, took us on a fun ride through the 50's and 60's, and connected everyone on a universal level: great music. We will invite you to come back for sure. Thanks again for sharing your wonderful talent with us and for being dependable and professional. Event planners, you'll be happy to have them perform. All around good experience! Cocktail hour - the talk of my wedding! The Boomerz performed during the cocktail hour of my wedding. I cannot speak highly enough about their professionalism and talent. I hoped they would be a memorable touch to the wedding - something my guests would enjoy and remember. They achieved above and beyond my goal! After the wedding I received countless feedback from family and friends about how much they enjoyed the Boomerz. They put their personalities on display and their performance was incredible! They put everyone in the celebration mood that transitioned seamlessly to the reception. I highly recommend these gentlemen for your next party or event! They will surely entertain any group and will make your event one to remember! Richard and the guys were just great. They were very thorough in their preparation, helped us with song selection and even wrote a small dediation to my daughter. They exceeded all expectations and everyone was impresssed with the group's harmony. They helped create a memorable evening and will long be remebered by all. Thanks Boomerz! I book Boomerz as a little surprise for my wedding guests as entertainment while they were eating. The pitch, beat, song types, and attire were all perfect. Working with them was very simple. We had two meeting prior to the wedding day where I picked out the songs, attire, and listened to them sing. They listened to everything I had to say and was able to tailor their show to match exactly what I wanted. They sang for 30 minutes nonstop while my other band ate dinner. All my guests were very surprise and I highly recommend them for a wedding. Two of the members of this group, Jack Gross and Richard Allen, are members of my church and invited me to attend this performance. I knew nothing about the Boomerz but I wanted to support my friends. I was pleasantly surprised. It was better than I expected. The music was great; the harmony was wonderful; the overall experience was fabulous. I would highly recommend this group. I coordinated with the group to perform at the charity auction durning our quilt show at the USF Botanical Gardens. They were terrific! The harmonies were outstanding...they really kept our audience entertained. I was at a charity auction waiting for it to begin and the Boomerz were performing before the aution so I just sat and enjoyed their music. I loved the acapella and barbershop renditions that they performed. It was a very enjoyable experience. I saw this group at the USF Bontanical Gardens when they preformed for a chairty event. They are very good and I enjoyed them very much! If you like the 'fifties' music then this is the group to hear. I am a student at the University of South Florida. I saw these guys perform at a charity event in USF's botanical gardens. They were amazing! I am a big fan of all things 50's, and the Boomerz were spot on. I'd hire them for my wedding, seriously. So fun, so talented! I highly recommend Boomerz. I hired them for my parents' 60th wedding anniversary. They were open to learning a few new songs that I had requested prior to the event. They arrived to our event on time ready to perform. They have beautiful harmony together and interact well together as well as with their audience. Boomerz are great entertainers with beautiful voices. And I should mention, they're nice guys as well!